HomeAll articlesData acquisition, Signal conditioning, VisualizationConfigurable safe small control system PNOZmulti from Pilz new with application simulation - simulate the configuration now also offline! Pilz: From Version 10.9 of the Software tool PNOZmulti Configurator, PNOZmulti projects of the configurable safe small control systems can be simulated offline, completely without the use of hardware. That way, Pilz provides a user-friendly aid to detect, analyse and remedy errors at an early stage. From Software version 10.9 of PNOZmulti Configurator, you can use the "Simulation" function to test the configured user program for safe monitoring of plants and machines even before they are commissioned. The "Simulation" function opens up considerable savings potentials during project planning. With the simulation, the user can ensure that his safety control system is "configured error-free" even before live application, and that the correct function of the program logic has been verified. 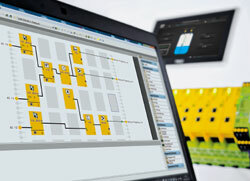 This way, Pilz supports the application simulation in handling user programs in a manageable way, despite the growing machine size and the increasing degree of automation. This is particularly beneficial with machines with complex safety devices and close man-machine interaction, where the operator must be protected by comprehensive safety mechanisms that are to be extensively designed. Simple logic elements, counters, operating modes as e.g. continuous mode are calculated automatically in a first step. Moreover, it is possible to perform a simulation of the overall application, when elements that are not simulated are brought to the required state by forcing the outputs (signal state is firmly assigned). This way, you can save the effort of having to define all the inputs. Simulation reduces the installation costs and supports you in reducing the risks for man and machine. With the PNOZmulti Configurator from Pilz, it is easy for users to plan, configure, document or commission. Simple diagnostics and visualisation options reduce downtimes on plants and machines.